All kinds of good stuff coming out of New York Comic-Con tonight for Gears of War fans. 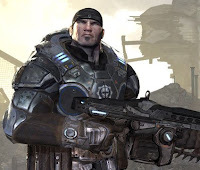 Joshua Ortega, the writer of Gears of War 2, heavily suggested that a PREQUEL to the original game is in the works: one that would deal with the events of E-Day. That was the day, 14 years before the first game takes place, when the Locust Horde burst out of the underworld and began their genocidal war against the humans of Sera. So that's potentially ten years worth of story that players might be able to experience and fight through. And if we're able to play as Marcus Fenix then I guess that could mean his tale as a COG soldier right up to the day he chose to abandon his post and try to rescue his father: the action that ultimately sent Marcus to prison. "You will not be disappointed in the next ten years," Ortega said. "It's a ten-year plan. Gears is long-term. The lancer is the new lightsaber." If you played through Gears of War 2 then you know there's all kinds of dangling threads waiting to be exploited. If Epic Games plays their cards right, they could wind up with the video game equivalent of Lost in terms of high-brow storytelling. This is excellent news! And I would like to see dlc based on the Pendulum Wars like the GOW:Aspho Fields novel.